Photo: Sunrise from Lom Lae beach. With the beautiful Phang Nga bay on Yao Noi’s doorstep, most visitors to the island will want to get out on the water and explore. A collection of tiny islands nearby including Ko Lao Lading, Ko Nok, Ko Khai Nok, Ko Pak Bia, Ko Khai Nai and Ko Hong offer sparkling white bits of sand and teal-toned waters for snorkelling. Longer tours around Phang Nga bay might include some kayaking into the hong or caves of the karst islands, a stop at Ko Pannyi, the Muslim fishing village, and busy "James Bond" island. 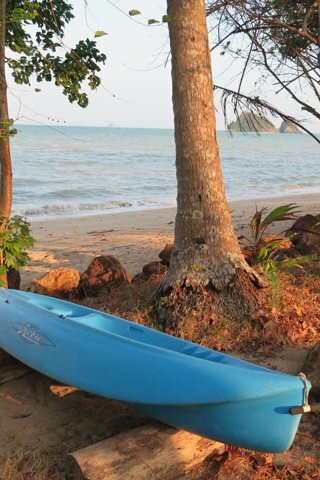 Every resort and bungalow operation on Yao Noi will have information on the various trips on offer, and some rent out their own kayaks. Lom’Lae resort organises day trips aboard its own longtail boat for 3,500 baht per person, half price for children, which includes lunch plus transfers if you’re staying elsewhere.